One of the most confounding aspects of the bear market is the collapse of stocks that were seen as safe. I am not referring to GE, which was known to be playing games with its accounting and was selling at much too high a price, but specifically to utility stocks. The collapse would not have been a great surprise if investors had understood the extent to which utility companies had turned away from their conservative past and gone off in speculative directions. The stocks are down so much that they probably offer one of the best opportunities in the market, but figuring out how to act on the opening is difficult because the condition of the companies is up in the air. With the arrival of de-regulation, utilities moved their plants formerly dedicated to the system into unregulated companies. Most set up trading departments whose inventory was their own power now available to be sold out of the system. After trading off much of their own production, they bought someone else’s as a substitute, creating a temporarily huge market in energy trading and a lot of short term trading profits. Once the initial swap-around was completed, they were left with little to do. As a result, trading departments are being abandoned or severely cut back. Left behind were trading “profits” using Enron type front loaded accounting for long term contracts, a decent portion of which are now uneconomic. The companies are now faced with writing off previously booked profits. The full extent of the losses is hard to guess, but may be substantial. Any losses could not come at a worse time because the companies are overextended in other areas and their financial condition has become precarious. Under the stimulus of de-regulation, a lot of new capacity was built and old plants re-started, creating a surplus, and price weakness. This threatens outstanding trading contracts, leaving some companies committed to buying energy at a loss, and others to abandoning contracts. Bankruptcy at Enron and near bankruptcy at Dynergy, the most active traders, threw a monkey wrench into the contractural structure because many of the contracts in which they were involved are defunct because of being uneconomic. The regulated distribution function is required to buy the cheapest electricity on the open market (the concept behind de-regulation to begin with), leaving the companies as a whole with higher priced purchase contracts they had expected to sell into their own distribution. The surplus capacity created by a rush of new plant building based on forecasts of a rapidly growing economy places many plants on a marginal basis. Companies like Calpine were not been alone in the mad rush to build new facilities. That is not all. Anxious to diversify, many plunged into foreign utility markets, often with unfortunate results. Desperately trying to get out to shore up their precarious balance sheets, many of the foreign operations are up for sale in a weak market. This means more writeoffs. TXU will take a $4.2 billion write off as it abandons or sells pieces of its U.K. operation for less than debt. That loss represented almost half TXU’s stockholder’s equity before a summer stock offering. And then there is debt. As capital intensive regulated operations with limited return on equity, utilities have always been relatively highly leveraged. In the exuberance of de-regulation, and supported by the liberal conditions in the capital markets at the end of the 1990s, they borrowed to support the new directions, leaving them in a bind now that things have gone wrong. Analyzing the companies takes me back to my banking days. Good bank lending is short term in nature and based on the balance sheet, not the income statement. Utilities are still reporting good profits, though the outlook is questionable. It is the balance sheets that are in crisis. Write offs, of goodwill, of trading contracts, of assets already and to be sold, are inevitable. While these write offs can be seen as a clean up that will allow the companies to get back to selling electricity (it is amusing that they are now emphasizing their traditional operations), the losses are important for highly leveraged balance sheets. Many of the bond indentures have requirements for maintaining balance sheet ratios that will be difficult to meet (which is why they are dumping assets for liquidity). Indentures also call for maintaining a decent bond rating, which they are having trouble meeting. Most of the losses have yet to be taken, so the threat is growing. One major utility, Allegheny Energy, admitted to not being able to meet the requirements and more or less dared bondholders to do anything about it. Therein probably lies the eventual answer. It makes little sense for bondholders to put them into bankruptcy, for these are steady operations that will eventually work out of trouble. But eventually could take a while, and the threat complicates current analysis. Some of the stocks undoubtedly are selling way under their true value, but patience is needed until the picture is clearer. I expect a wave of year end write offs and some divisional bankruptcies (some already), after which sensible analysis may be possible. One reaction of utility companies has been to flood the market with equity offerings without revealing the depth of the problems. Investment bankers have been up to their usual tricks, putting another one over on investors, and most of these offerings are now deeply in the red. Buyers should have been suspicious of massively dilutive offerings that made sense only if the companies were in trouble. Without the flood of stock offerings, there might already be blood on the street in a partial rerun of the telecommunications disaster. This makes the stocks all the more intriguing. Just think, some of the companies can be bought at 50% of what supposedly knowledgeable institutional investors paid in large quantities earlier this very year. I made the mistake of buying some of these stocks for conservative investors looking for dividends when prices plunged. Allegheny Energy, for instance, was seen as a relatively conservative company whose stock was cheap and the dividend extraordinarily high. The problem for conservative investors is that many have cut their dividends, and more cuts are inevitable. Management has been swearing by their dividend, but reality is getting through. Longer term these will remain dividend oriented companies. As the smoke clears, yields over 10% should be available. This kind of return should lead to a doubling of the stock price. In the end this is still a steady and needed business, and the problems will be worked out far more easily than with massively overcapacitied telecommunications. Measuring the affect of overcapacity is one of the current imponderables. Many partially completed plants will have to be finished, but everything possible has now been cut off. Incidently, many of the new plants involve gas turbines made by GE. GE is booking cancellation fees and still delivering some turbines, but it is looking at the sudden cut off a business that has been a substantial contributor to profits in recent years. Between jet engines, gas turbines, and a squeeze on GE’s massive spreads in its financing operations from any increase in interest rates, GE’s earnings could be down sharply in a year or two. The braggadocio gushing from Immelt after he took over (he promised a higher growth rate than the already impossible rate achieved by Jack Welsh) never sounded right, and is becoming increasingly hollow. Will Jack ever cash in those 13 million plus options, presently worthless after having a value over $200 million two years ago? 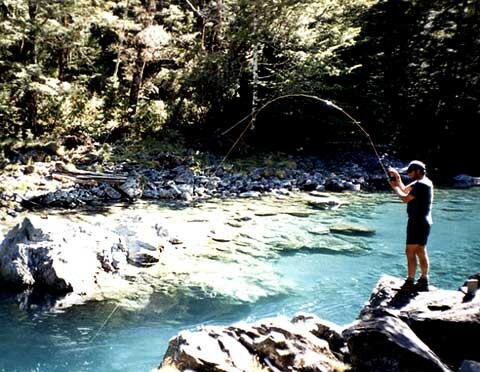 These photographs were taken by Finn Stinson, operator of “FINNS” fly-fishing guide service out of Christchurch, New Zealand, which specializes in fishing for brown trout and salmon. Finn and his brother Ru were world class fly fisherman who had fished in New England, Argentina, Alaska, British Columbia, Australia, New Zealand, the Pacific Islands and countless small streams and river all over the world. The brothers tragically passed away in 2004 in a single car accident while traveling back to Alaska after fishing for Steelhead Trout on the Babine River in British Columbia. They are sorely missed by their numerous friends around the world. To me right now, Nirvana would be to be diving into Lake George or sitting on a porch on Martha’s Vineyard, overlooking the sea, or watching the Eel River float by. Nirvana means such different things to us all. The Burmese are Buddhists–more than 80% are Buddhist anyway–and they are gentle and kind and very devoted. And I wonder, what is it that they want that causes such suffering? They want their children to grow up without malaria, they want to live in a home that is dry, they want an umbrella that doesn’t leak, and they want a job. None of them, it seems, want to get rich, drive a fancy car, and live in a big home or go on vacation. A want for someone in Myanmar (Burma), who is not Chinese Burmese or Indian Burmese, might well be to have a family feast, with enough space in a home for their friends and relatives, or to maybe buy a fresh longhi (sarong). Ah, Nee, I thought, we are all suffering, but you mate, I agree, are suffering more than we are. 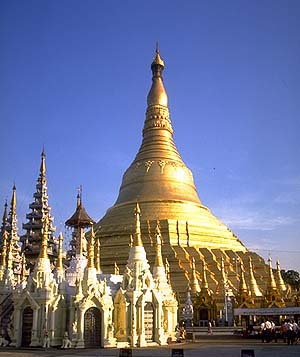 And rest assured, you will get a tip upon finishing our tour around the Shwedagon Pagoda. Nee, dressed in a clean longhi and navy blue collared golf shirt, showed us around this enormous religious space, built almost two thousand years ago. The main section (which looks like a giant pointy-topped bell) is just under 90 meters high, is encased with 60 tons of gold leaf, and is truly something to see. I’m just glad it was an overcast day–otherwise sunglasses would have been a must. It was built by two merchant brothers, and thousands of devoted servants, to honor Buddha, and it purportedly contains eight strands of Buddha’s hair. At the top of this structure, a 75-carat diamond is encased–supposedly still there. The sharp point at the tip of the spire would not allow anyone to scale to the top to steal it, although one bloke–a Portuguese trader and adventurer by the name of Philippe de Brito, who spent many years in Myanmar–did make an attempt to pilfer the whole top portion of the pagoda. He got as far as a nearby river, before the bell accidentally slipped into the water and remained there, stranded, for a century or more. Some stories have it that the bell itself, which had been the object of de Brito’s affection, could even be seen poking though the surface when the water was low. That was roughly in the early 17th century, and his punishment for messing with sacred Buddhist symbols remains clear: he was impaled. Unfortunately he didn’t position himself properly, for execution, and it took him two full days to die. Yikes. Poor Senhor de Brito. The Portuguese trader didn’t make it, but the pagoda was eventually put in order, and although, later, the British tried to take it down again, and earthquakes caused damage, it is very clearly still in the middle of Yangon, able to be viewed from all parts of the city–a stunning sight. Nee lead us through the pagoda terraces, where Buddhist novices, some as young as 6, 7, and 8 years old, with shaved heads (both girls and boys) celebrate their initiation ceremony with lotus flowers, Buddhist stone, 180 round gem prayer beads (the Buddhist mantra is said 180 times at a go), and prayer and song. If a Burmese is lucky, he will visit this sacred place at least once in his life, so people come from all over this beautiful country–the largest country in Southeast Asia–to savor the experience. The rainy season has begun, and a storm, a cyclone to be exact, is brewing over the Bay of Bengal. The wind is strong, and we all run to find cover underneath prayer room overhangs facing the main tower. We are surrounded by statues of Buddhist deities–each representing different abilities to grant wishes to the truly devoted. The Burmese are knelt in prayer, palms together, thumbs either facing their heart, or their arms raised higher, thumbs pointing to their noses. They bend down to touch their noses to the floor, and stay kneeling for long lengths of time, concentrating their minds on the Buddha and his teaching. They are very serious. …Eat little, and sparingly, be kind to one another, speak gently to each other, never revile another human form, live in as secluded and peaceful a place as you can, to concentrate yourselves on higher thoughts…. That sounds nice, I think. Nirvana. The deity I spend the most time in front of blesses those who are in want of children, so I gave her a necklace of jasmine we bought from the flower venders, and placed a couple of lotus flowers in the flower pot. Why not? I thought. Couldn’t hurt. Then Nee took us to pay alms to our respective “planet.” My husband Jamie, born on March 9th, falls under the planet for the dragon. I fall under the planet for the lion. So we pour water over the respective deities, and “clean” them, to show our appreciation for all of the luck we have in our lives. And then we concentrate our minds on the Buddha to ask for future happiness. We didn’t find Nee, Nee found us–sort of tagged along with our tour group, and noticed two clearly white tourists, wandering around the Shwedagon Pagoda, probably thinking, Okay, awesome, giant, very gold–a bit gaudy–would have liked to see it when the British explorer Ralph Fitch fist saw it, overgrown with weeds and trees, among the low-lying mountains. But alas, the Burmese like their gold, and they seem to like fresh yellow paint. They’ve painted fresh, peaceful faces on a lot of the Buddha’s, but we thought the originals would have been so much more intriguing. Myanmar, or Yangon, really, in the short time we’d been there, seemed an overgrown, decaying colonial outpost. At one time beautiful and efficient, remnants of what it once was had been left fairly unattended to for over 50 years. The lovely old estates are crumbling and many are now deserted–shadows of colonialism–weeds and trees covering once pristine lawns and parks. Handsome white-washed stone walls, elaborate wrought iron gates, lush gardens, water fountains, homes with stylized facades that reminded me of gingerbread detail, all stand side by side with the Burmese timber structures that were as character-filled, if not as imposing as the Anglican churches nearby. The infrastructure is more efficient than Vietnam and Cambodia–less traffic, no motorcycles, more traffic lights, and people obeying them. But Yangon could use a new coat of paint, a bit of sprucing up, a burning of the opium fields, and a benevolent leadership, I think. Myanmar is currently governed by a military junta that often turns a blind eye to a fair judicial system. There has been a history of suppressing democratic ideals, which has repeatedly led to the mistreatment of the members of the democratic opposition. A case in point: the largest democratic political party, the National League for Democracy, is headed by a Nobel laureate and peacemaker Aung San Suu Kyi; she has been in and out of house arrest and forbidden to leave her country (or at least forbidden to return, if she does leave) for much of the past decade or more. Our tour guide operator (not Nee, but our proper guide) looked, in my opinion, exactly like Aung San Suu Kyi: beautiful, chiseled, medium-to-long hair, cleanly pulled back in a pony tail, about 50 years old (maybe older), but looked much younger. She had beautiful skin and kind eyes, and was very somber–almost angry when she was not smiling or when she was not talking with someone. But when she smiled, she beamed, and you knew that was who she was, truly. Her name was N’uahn. Of all the people we’ve met in Southeast Asia, the people of Cambodia, I thought, were most beautiful. Something about their eyes, and their inner spirit–they glowed… Especially the children. But the people in Myanmar, both the men and the women, are elegant and confident. They seem to know who they are and where they’ve come from, and despite colonialism followed by harsh military rule, their cultural heritage remains basically intact. All the men wear their traditional longhi, a long Indian-type sarong, with either a colored golf shirt or cotton button down shirt; and the women wear something similar–a long straight batik skirt and matching top. The Burmese now live their lives with virtually no outside influence, as opposed to the Cambodians, who had much of their country and culture destroyed by the Pol Pot regime and various tomb raiders. The Vietnamese, a bit similar to Cambodians for being as lovely as they are, are under considerable outside pressure from Western commercialism–which in a way has resulted, or has seemed to result, in a mania for money and all of the “evils” surrounding want and entitlement. It seems that the Burmese are not very interested in serious merchanting or business. They just want to live, have a job, and have a family. It seems to be the influence of the Chinese and the Indians that creates an almost avaricious atmosphere, desperate for money. A fast buck here, a few chats there, sell, sell, sell. Wear more gold watches. Appear rich. Make more money. The Burmese, I bet, before the British ruled the country, and let in thousands of Northern Indians and in the process a tidal bore of cultural diversity, were an isolated, easy-going, agrarian society. Spending their time and money on Buddhist devotion, and in the creation of lives and religious devotional sites. In the 1960s, approximately 12 years after the British left, the Burmese literally rounded up the Indians and Chinese, and told them to leave the country–taking with them no more than 75 chat (currently, approximately 50 cents), and whatever else they could carry. Clearly some time between then and now, they’ve been let back in, to better or worse consequences. Food in Myanmar is not a strong memory: some curry, some rice, fruit, asparagus, lemon leaf, okra, sautéed crickets. In all, I noticed that among the ethnic Burmese, food is not such a big deal. The monks eat only until noon every day, and most Burmese have gone through Buddhist training. Gluttony, we realized was frowned upon. The Chinese Burmese, on the other hand, love their food and their feasts, as a time for family and celebration. I am more Chinese than Burmese, I’ve decided. This is a country to move slowly through, making one’s way up to the northern hill tribes–to Inle Lake near Mandalay, and Bagon. Burma has over 35 ethnic tribes–the ones closer to Nepal are the Himalayan Burmese; the ones further south, the Shan; the Wa (who Jamie likes to read about) reside within one of the 14 “states,” ruled by a mafia-like warlord who doesn’t allow foreigners in and is said to be the main cultivator of the opium trade. We’re not going to Wa. So with Nee gone, and the cyclone moving closer to Yangon, Jamie and I start our time in Myanmar. In all, we hope for a nice taste of a country that should also be seen in the dry season, and never with a bus full of Singaporean tour guides, I’ve decided. From the moment I learned that my six-week old son needed a passport for an upcoming trip to France, I knew that his mother, Beth, and I were in for a steady diet of headaches and laughs. The process, which I hope is near completion, has indeed provided us with both.Since the onset of this ordeal, I have tried to envision our son, Archie, going through French or American customs. While Beth and I are convinced that he is quite advanced and extremely gifted, I doubt very much that he could successfully answer any questions from immigration officials on either side of the Atlantic. At this point, the only things he could likely declare is that he enjoys sucking his fist and things that are soft and fluffy. I am sure that the American government has determined with good reason that infants need passports, and in today’s world of heightened security, countries can never be too cautious. However, there must be some sort of happy medium between national defense and abundant wastes of time. I also know that the U.S. Congress has much to do, but I hope that in between attending six-figure fundraisers and distancing themselves from their former pals and sunken figures at so many scandalously failed corporations, the good men and women of Washington could alleviate some of the obstacles in obtaining an official document for a 12-pound, 26-inch boy. Let me also state, that it has been my wife who has dealt with the bulk of the responsibility for getting Archie his passport. She has been the one to load him in the car and set out for the post office, photo mat, and town hall. I have principally been an entertained eyewitness to the entire process, but still believe I have a duty to share the absurdity of the situation with fellow parents and travelers. Most of the information concerning passport issues can be found on the State Departments Web site, http://travel.state.gov/passport_services.html. Not surprisingly, the site is a lot like the government itself: it offers some guidance, without being completely comprehensive or totally insightful: it has decent potential, but fails in its overall execution. Much of the site is vague and incomplete, and it reminds me of Dan Quayle’s vice presidency. Sure, he was young, handsome, and energetic, but he also misspelled potato in front of a second grade class. The Web site provides some assistance on what parents should expect when applying for a passport for anyone under the age of fourteen and it should be utilized as a starting point. It details some of the whats, whens, wheres, and hows that are moderately useful, but are not wholly reassuring, in this quest. The site is teeming with references to official issues like, the Child Citizenship Act of 2000 and Public Law 106-113. And no governmental resource would be complete without a tedious list of numbered forms such as DS-11, DS-71, FS-240, and my personal favorite, DS-1350. I also gathered from the Web site that Archie and I should avoid places such as Iran, Iraq, Uzbekistan, the Kyrgyz Republic, and other inviting destinations. These warnings proved to be a tremendous asset, as I have since reevaluated my decision to rent a summer place in Baghdad. As I wrote earlier, the State Department Web site did proffer some information that enabled us to begin our quest for Archie’s passport. The site offers a search function that determines the nearest designated passport agency. Besides most post offices, other facilities may include municipal buildings, clerks of court, and public libraries. We opted for our local post office, piled Archie and his countless travel accessories into our station wagon, and set out to witness effective government in action. Picking up the application proved to be quite easy, but we soon realized that like an Internet IPO, the good times would not last forever. The first sign of trouble was securing a suitable photo of Archie for his passport picture. I do not know a lot about the world of fashion, but I honestly believe that prospective Vogue cover shots are given less scrutiny than were those taken of Archie. We tried to follow the guidelines detailed on the Web site, but were frustrated early and often by the minute flaws that disqualified countless photos. More than four sets of photographs were rejected, and my wife and I were left in a state of amused frustration. First of all, propping up a two-month-old child on a stool and getting him to face a camera is no easy task; Beth and I thought Archie’s unyielding cooperation should alone merit acceptable photos, but again, the government saw otherwise. One set of headshots was rejected because there was not enough of Archie’s head in the picture. How could that be? I pondered. The boy is almost all head and no body! Another pair was rebuffed on the grounds that one of his ears was not entirely visible. The last and most amusing rejection was based on the darkened nature of the background screen. The reason for the dimmer background, I protested, was due to my crouched and cramped body, which had been positioned behind Archie to support him while he sat for another photo shoot. Keep trying, I was flatly told. Luckily for us, the obliging staff at the photo mat joined in our obsession of satisfying the requirements, and worked industriously to help us obtain sufficient headshots. At last, with the stars properly aligned, we captured our white whale. The accepted shots did not differ vastly from the previous ones, but the postal inspector sanctioned our most recent submissions, as we inched one step closer to getting Archie his passport. Pictures need to be 2 inches x 2 inches and identical. Photos must be taken within the last six months (not an issue for us, as Archie had only been on the earth for about 60 days) and show current appearance. A frontal view of the full face is needed with white or off-white background. The picture of the face must be between 1 inch and 1 3/8 inches from the bottom of the chin to the top of the head. No hats or headgear that obscure the hair or hairline are allowed. No uniforms are tolerated, with the exception of religious wear worn on a daily basis. Color or black and white photos are acceptable. Dark glasses and nonprescription tinted glasses are not permitted, unless for medical purposes, in which case a medical certificate may be required. After completing the back and forth with the post office and the photo mat, the process seemed to gain some momentum and the inanity was reduced, although not completely eliminated. With our officially authorized photos, we tackled the passport application, which we collected at the post office, and it was reasonably straightforward. The Web site claims that applications can be downloaded, an assertion I found to be slightly dubious. I had a difficult time completing the process, and while my wife possesses stronger computer skills, I am generally adept enough to handle a simple file download. With our completed application and pictures, our confidence was on the rise. We were fairly certain that Archie would be joining us on the trip, and we would not have to leave him at the kennel with our faithful dog Aggie. At this stage, the website again proved valuable as Beth and I learned what was needed to complete the process. 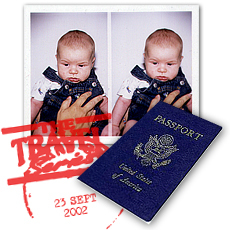 Proof of citizenship for child and parent was a prerequisite for his obtaining a passport. To establish Archie’s citizenship, another visit to a government building was called for, so his mother set off for town hall to retrieve his birth certificate, which is the most logical document to use. Parents who cannot obtain, or do not have, a birth certificate for their children face further hurdles and additional forms that are detailed on the Web site. Beth and I were able to prove our own citizenship by providing one of the following documents: valid U.S. driver’s license, valid and official U.S. Military ID, valid U.S. government ID, valid U.S. or foreign passport with recognizable photo, alien resident card from the Immigration and Naturalization Service (INS), or naturalization/citizenship certificate from INS with recognizable photo. We then had to present sufficient evidence that Archie was our child. Given the fact that today, kids can now be adopted on the Internet, I wholeheartedly support this measure. Again, this was uncomplicated for us since we are listed as his parents on Archie’s birth certificate; however, parents without a birth certificate, and custodians or guardians should again refer to the Web site or call the National Passport Information Center at 1-900-225-5674 ($0.55 per minute, per call) to locate other acceptable documents. Yet another step the government necessitates that I applaud is a consent form from both parents permitting the issuance of the child’s passport. I gather this is to prevent one spouse from leaving the country with the child/children without the support or knowledge of his/her partner. Obviously, this could be a valid concern when custody battles turn malicious. While I am fairly certain that neither Beth nor I is likely to grab Archie and join up with a band of Basque separatists, nonetheless, I appreciate this provision. If both parents are unable to appear together, there are other options available, including a consent form for the absent parent to sign. That’s about it for the initial application process. Beth and I are currently awaiting Archie’s passport, which we hope will take him to France, and other grand destinations throughout his life. Since Archie will be just shy of his four-month birthday when he arrives at Charles De Gaulle Airport, it is unlikely that he will remember his first international journey, but I know that his mother and I will never forget it. And by the way, I realize the last few paragraphs have exhibited some beneficial facets of the State Department, and our government in action, and I may have been too harsh in my earlier appraisal. I’d like to apologize to them for that ‘Dan Quayle’ crack, it was a low blow. Editor’s Note: You’ll be happy to learn that Archie did indeed receive his first passport, and is well on his way to becoming a world traveler. Of course, he’ll need to get new one once he grows some hair.